Amanda's Glass Art is your all in one shop for stained glass in West Virginia. If you need a stained glass product or supply - contact us today! Located in Charleston, WV, Amanda's Glass Art is the only retail stained glass studio in the Charleston area. AGA is located in a trusted business setting in Kanawha City which provides accountability and accessibility that no other glass artisan in the area can provide. AGA is open to the public during regular business hours every day of the week except Sunday and Monday offering availability to our customers surpassed by no other glass artisan in the local area. 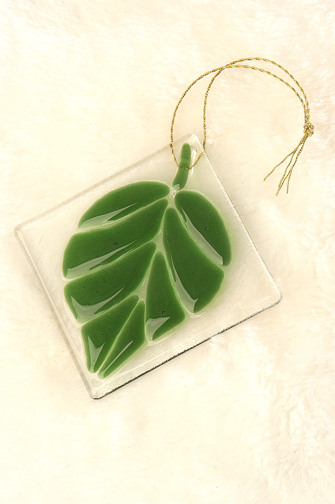 Retail glass supplies are sold at Amanda's Glass Art making wonderful gifts for glass hobbyists of all ages. AGA regularly stocks a wide variety of stained sheet and fusible glass and all the glass supplies and equipment needed for a stained glass hobbyist. From glass cutters to glass kilns - AGA has it all year round! Retail stained glass finished products are also displayed and sold at Amanda's Glass Art. Custom glass design is handcrafted at AGA. 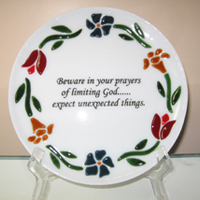 Custom glass is designed by Amanda Buckner, the owner of Amanda's Glass Art. Each custom design is a guaranteed original, never to be duplicated. 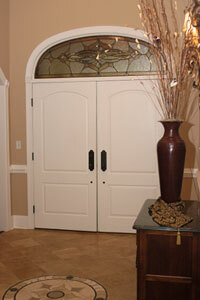 AGA produces custom stained glass for residential homes, businesses, and churches. Amanda will guide you through the artistic process, from the creation of the design, to color selection, to the execution of the final product. Amanda's Glass Art depends on maintaining our reputation for professional and timely service and will work to accomidate your glass budget. Whether it is a small suncatcher, glass award, or large stained glass window - AGA can custom create it all in any design style you desire! Visit our gallery for photos of existing custom glass products handmade by AGA. Don't go anywhere else for your custom glass needs - AGA has the experience and skill required to create the perfect window or glass product for you. 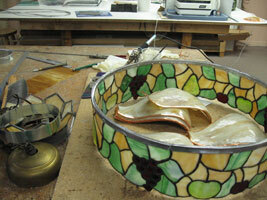 Stained glass restoration and repair is another custom service that Amanda's Glass Art provides. Has someone thrown a rock through your window or knocked over your beautiful Tiffany lamp damaging it? AGA can provide an onsite estimate and local, quality repair work at a fair market price. 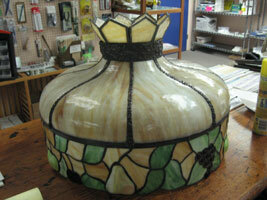 Visit our gallery to view before and after photos of glass products that Amanda's Glass Art repaired. From small suncatchers to glass lamps to antique church windows, AGA can fix them all. 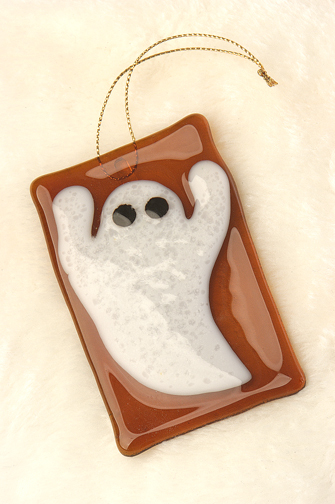 Classes for hobbyists are also offered at Amanda's Glass Art studio. All types of classes are offered for beginner and intermediate glass hobbyists. 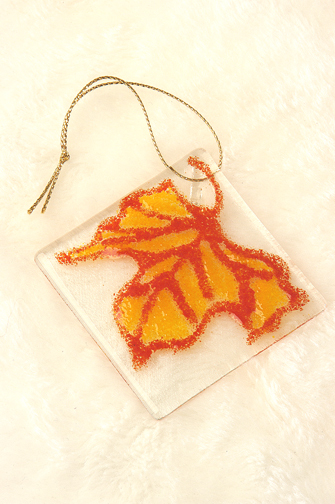 AGA teaches beginner's cutting, copper foil and lead came assembly, fusing glass jewelry and more. Specialty classes are also available upon request. Need a new hobby or want to further develop an old one? Call Amanda's Glass Art to sign up. Retail and wholesale stained glass is designed and handmade at Amanda's Glass Art. AGA provides four West Virginia galleries with stained glass art: Tamarack, The Best of West Virginia in Beckley, WV Market Place in the Capitol Market, Art Emporium and Gallery Eleven in downtown Charleston. 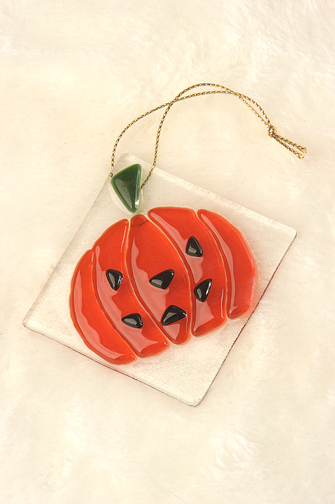 Retail glass products can also be purchased at AGA's MacCorkle Avenue studio. Visit any of these locations and walk away with your own handcrafted work of art made by Amanda's Glass Art.